Welcome to our lesson for Trinity Sunday, June 11. Today we celebrate the trinity, which is perfect timing, considering we just welcomed the arrival of the Holy Spirit last Sunday. For this Sunday, we’ll use Lesson 6: Holy Baptism from the Winter (purple) book, p. 70-76. 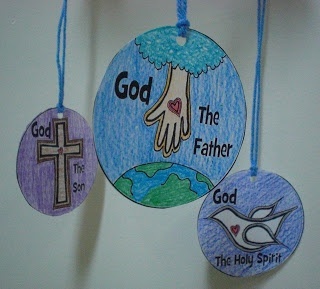 The lesson is on baptism but it’s perfect for Trinity Sunday since a major component of the lesson is the Trinity. At the beginning of the script, it refers to “the Creator, the Redeemer, the Sustainer.” Do use those words, but add in an explanation of what they mean. Redeemer and Sustainer will be unfamiliar words to most children. I would suggest that you modify the part of the script on baptism, fitting it to the way we do baptism in our church. Each of you should have in your classroom a bowl in which to pour the water, a pitcher, and a person (doll) to be baptized. I would encourage you to talk about the baptismal statement that baptismal candidates write (and a person special to them reads) expressing why they want to be baptized and what baptism means to them. I’ll have a copy of a baptismal statement that one of our children recently wrote in your rooms to share. (With permission, of course!) You might also talk about Discipleship Class, which our 4th and 5th graders can take in the fall and spring to learn more about baptism and being a disciple of Christ, before they are candidates for baptism. The children would certainly enjoy the candle lighting part of the lesson. I hope you’ll feel brave enough. You might use tea candles (I’ll make sure there are plenty in your rooms.) For safety’s sake, you might have them sit on the carpet for this lesson and put the tea candle on the carpet in front of them, asking them to keep their hands in their laps at all times, assuring them that they will each have a chance to “change their own light.” I’ll make sure you have a candle snuffer in your room-so the children won’t blow out the candle, spattering wax on the carpet. If you choose to do this part of the lesson, I’m confident they will always remember it! 1. I wonder what was your favorite part of this lesson. 2. Today we heard more about the Trinity. We poured the water and talked about the water of creation. I wonder if God the Father is still creating today. 3. We also lit the big candle and talked about Jesus, the light of the world. I wonder how Jesus is a light. I wonder why we call him that. 4. We also remembered the Holy Spirit with the dove and the perfume. I wonder why we use perfume and a dove to remind us of the Holy Spirit. 5. I wonder what baptism means to you. 1. Your class could make a larger mural illustrating the three parts of the trinity, showing them intersecting like the circles of felt we used in the lesson. You could add illustrations to each circle. For God the Father, the children could draw creation in action, or their favorite old testament stories. For God the Son, the children could add drawings of their favorite Jesus stories, and for the Holy Spirit, the children could draw ways the Holy Spirit helps us–knowing right from wrong, giving us strength in times of trouble, helping us tell others about God, helping us understand the Bible, etc. Each child could do this individually, but it could be more fun doing it together. 2. 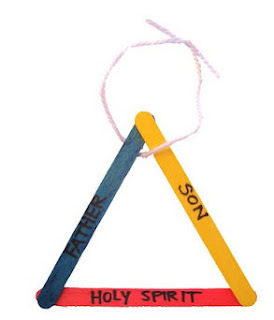 You could make simple trinity decorations, like this one from a blog with lots of great ideas,here. You can also glue on some symbols. This idea comes from this site. 3. You could talk about how the shamrock or 3 leafed clover is often used to explain the trinity- one plant, with a leaf for each of the three parts. Then go clover hunting around the church. 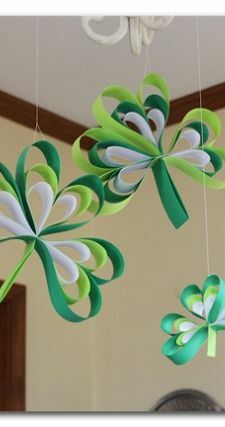 The children could pick a clover, bring it back, draw it big sized, and label each leaf with part of the trinity. 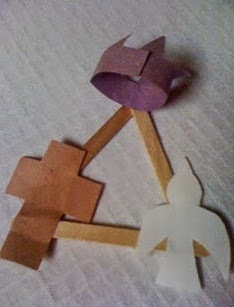 The fourth graders made something like this during our Easter lessons. Find some more art response ideas to get the kids started, go here to my Pinterest page.